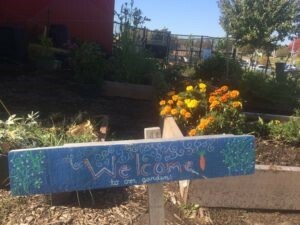 Most people know Crops from our Community Gardens across Lincoln, but we've also been working hard to make growing food a part of the daily lives of students at several local schools. To see how we're making a difference with Lincoln's kids, learn more about our most recent youth project at Educare Early Childhood Development Center in Lincoln. At Educare, children and their families are engaged in every step of the education process to provide a comprehensive approach to improved learning outcomes. Based on the model first developed in Chicago and later expanded in partnership with the Buffet Family Foundation, Educare helps students to be more prepared to enter Kindergarten scholastically and socially-emotionally. For Kendra, a mother of four children, all of whom have either graduated from Educare or are currently enrolled there, the impact has been profound. With one son who has severe asthma and another son who is autistic, Kendra needed additional support to help her children be successful. She knew Educare was a good fit for her family right away, because they focused beyond the school day to help the whole family be successful. 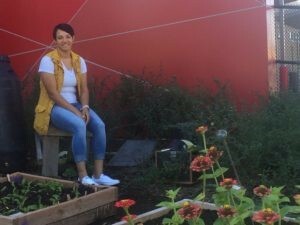 As a member of the parent advisory board at Educare, Kendra was intrigued when the idea of a school garden was proposed at a meeting last year. Not a gardener herself, Kendra still thought a garden for the kids would be a good addition to the learning environment at the school. When the raised garden beds were built by Crops last spring, Kendra saw right away the impact it had on her kids. Before long, Kendra and her children were building their own garden at their house. All four of her kids have enjoyed getting their hands in the dirt at the Educare garden and the new garden at their house, but Kendra says her son with autism in particular has benefited. This summer, with her older kids moving up to Kindergarten, her autistic son had a rough transition as the only sibling still at Educare. But, Kendra says, the garden "was a place he could be and calmly take care of the plants, which gave him a sense of responsibility." With a garden at their school and now at their house, Kendra has also seen a change in how her kids respond to unfamiliar vegetables. Her sons loved picking fresh tomatoes from the garden this summer and even gave eggplant a try; something they never would have done before, says Kendra. Besides our new garden at Educare, Community Crops recently celebrated our 15 year anniversary with a move to a new location. Now at 1301 South 11th Street, we invite you to an open house on April 13, from 4:30 - 7:30 PM. (Sign up on our Facebook page). For more information about Community Crops, visit our website or contact us.